Paradise Suite is a WMS gaming’s own holiday beach themed casino slot machine game. The background theme of the game is backed up with wonderful theme music and both of them makes the game so attractive that any player will love to explore the slot and most importantly win bonus rounds and jackpots. The game does not contain progressive bonus feature or in-built multipliers in the main game but does contain jackpot features and slots are designed in such a way that the player wins the game more often than not. The features of the game such as Key bonus and Surfboard bonus acts as a jackpot boosters and simply increases the initial wagers and pays out a massive coin bonus like no other. The game is available to play in various online casinos all across countries such as UK and USA for both real money and for free. The game contains 5 reels, 15 payout lines, and 3 reels. The paylines of the game move from the position of left to right. The players will be hitting three symbols in the same row for hitting a win. The smallest valued symbol too gets a decent payoff if it appears twice in a row. The maximum paying symbol in the game of Paradise Suite is the purple flower from a garland. This gives out a massive prize of 10000 coins when a player manages to hit the same 5 times in a row. The next symbol is the champagne bottle and it too contains a good payout of 5000 coins. The snorkeling equipment is the next in the line and pays out 2000 coins. For both these symbols, a maximum of 4 times hitting is required to win. Other smaller symbols in the game include a pair of shorts, cocktails, a pineapple and a camera and these contain prize coins worth 800, 500, 350 and 200 coins respectively. Some other lower valued symbols in the game include green leaf and one sandcastle. These are incredibly low valued and only are worth for 140 and 60 coins and that too when 5 symbols are hit in a single row. Alternatively, these two symbols pay even for hitting twice in a row. The first bonus feature is known as the Key Bonus round and it can be generated by hitting the hotel room key bonus for two times anywhere in the reels. After hitting twice, the game provides a choice of keys and the players are required to choose anyone. Then an animated clip appears to finally see off the player to the hotel room. Once the player enters the room, instantly a credit prize appears and the players are required to pick them up. The entire graphics including the clip makes the gameplay very enjoyable. The next feature is called as the Surfboard Bonus Feature and this can be activated when a player hits the Surfboard symbol three or more times anywhere on the reels. On hitting so, the players will be given a separate popup screen and it contains a surfer performing a series of tricks. The players are required to choose any one of the five surfboards and hope to see the surfer doing as many tricks. On hitting eight tricks, a decent payout is assured and if the surfer lands in the water way too often, the chances of earning big bonus is low. Paradise Suite online slot is an online slot machine developed by WMS gaming and invites the players a virtual trip to a tropical vacation retreat. The beach themed game is backed by an eye-catchy graphics and has beautiful background music to its credit. The game is a popular option for the gamblers as the game contains two important bonus features, which contains free spins and increases the winning stakes massively. The game can be played online and requires absolutely no download or any registrations. The game is available to play in all the WMS game supported casinos all across the countries of UK and USA. Since it requires no money, a player can play free Paradise Suite casino slot machine any time of the day and enjoy winning coins and hitting jackpots. 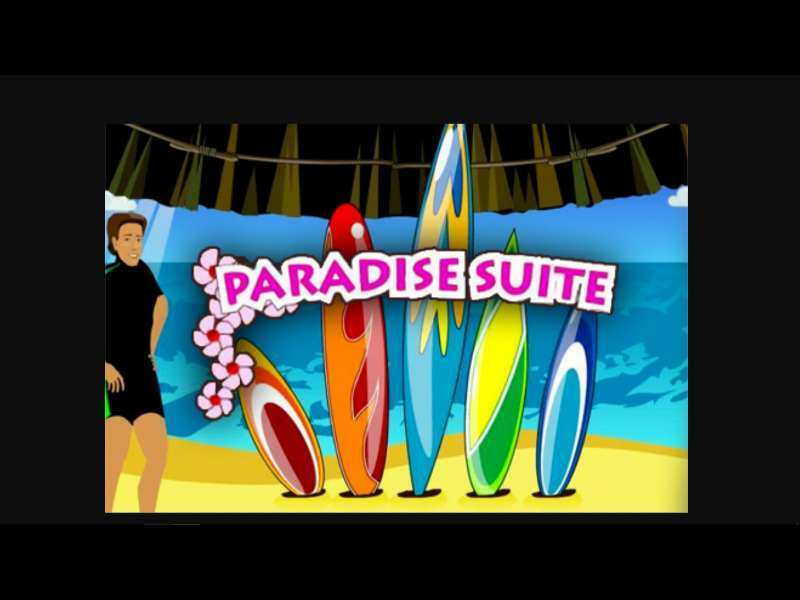 0 responses to "Paradise Suite Slot"